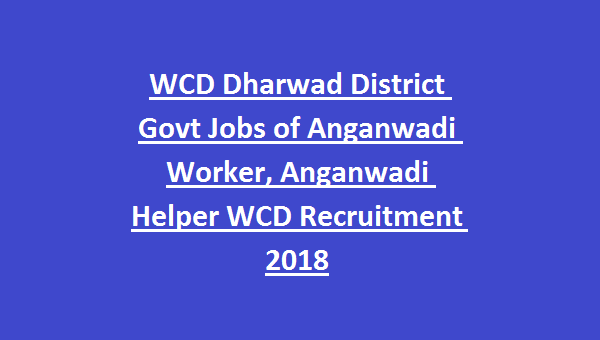 candidates applying for Anganwadi Worker/ Helper Jobs using www.anganwadirecruit.kar.nic.in and apply before 05.30 PM on 07-01-2019. Candidates will be selected for WCD Dharwad Anganwadi Worker/ Helper Jobs is based on work experience, Academic Qualifications and Reservation. Age of the applicant for all posts in WCD Dharwad Recruitment is 18 years to 35 years. 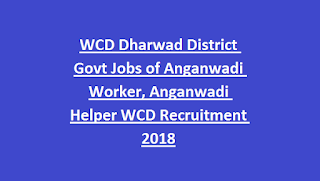 Full details of Age limits, relaxations, Educational Qualifications, Pay Scale of Women & Child Development Department WCD Dharwad District Recruitment of 73 Anganwadi Worker, Anganwadi Helper Jobs are provided below. Last date to submit WCD Dharwad Online application forms: 07-01-2019 before 05.30 PM. Total vacancies in Dharwad Women & Child Development Department WCD Anganwadi recruitment are 73 posts. 1. Anganwadi Worker: 19 posts. 2. Anganwadi Helper: 54 posts. Anganwadi Worker: Candidate must have passed 10+2 qualification from recognized Board. Mini Anganwadi Worker: Candidate must have passed 10th class qualification from recognized Board. Anganwadi Helper: Candidate must have minimum qualification is 4th standard and higher qualification is 9th standard pass. See the WCD Dharwad Notification for more qualifications. Minimum Age of the candidate for WCD Anganwadi Jobs is 18 years and maximum age limit is 35 years. Relaxations for reserved category candidates is admissible as per rules. Please visit WCD Dharwad official Notification for Pay Scale details. Candidates will be recruited for Anganwadi Worker/ Helper Jobs based on their work experience, Academic Qualifications and Reservation. See the notification for more selection process. Interested female candidates with essential qualifications are required to visit WCD official website www.anganwadirecruit.kar.nic.in. Search the desired post and apply through online. Last date for application submission is 06-01-2019.